Unfortunately in our world today, we as Christians, are going to be persecuted but hey! hang on minute! It's not just the world outside who is out to get us - very frequently it is our best friends, our family and even ourselves. Persecution comes in all forms and types - we can be ostracised at work for our beliefs, we can even be fired! I recall with much clarity the case of the wedding cake decorator in the USA who lost her livelihood, home and business because she stood up for what she believed and she paid the price. It seems to me that as the world cries TOLERANCE that it is only the Christians that have be tolerant. We need to show love to all and as Christians it is extremely hard for us to follow the worlds definition of that tolerance. What the world now sees as tolerance is for all people to accept those beliefs as true and if you don't you are labelled as intolerant and in many cases can be prosecuted, fined and/or even jailed . So what does God's word say about the fact that in this day we are being persecuted and actually hated by the world for our belief and acceptance of Jesus as our Lord and Saviour. Jesus Himself said that we are to turn the other cheek and tolerate others beliefs. In Luke on the sermon on the mount Jesus said "blessed are you when others reject and even hate you for following me". They hated Jesus in the same way, so we cannot expect any thing else but the same treatment. On looking at it from this point of view, we cannot and will not get tolerance from the world out there towards our Christan beliefs because they hated Jesus long before they hated us.We clearly will not EVER receive tolerance from the world. Sort of makes sense when we see it as Jesus puts it so plainly in Luke. I was shocked, but I guess I shouldn't have been, when I read in our local newspaper just yesterday in the 'letters to the editor' column of this man's approach to Easter and what it means to him. He was very scathing in his letter and ridiculed Jesus as some fiction made up because, and I quote, "astronomical observation has failed to detect him". He maintained if he did rise from the dead then obviously we should be seeing him in the heavens - I maintain we are!! Just look up! He went on to say that Christians are living in a 'pre-scientific' world and that we should look at "facts and not myths". He goes on to say and I quote "If the Christians are right, we are all missing out . If they are wrong, they are deceiving themselves and the rest of the world with their message." Yes! We are in a world brimming and bubbling over with persecution. What does Jesus say we should do when we are faced with this type of persecution? Take him to court and fight like crazy to clear the name of Jesus? Maybe personally have a 'dust up' and see who comes out the 'winner"? NO! Jesus said we should LOVE our enemies and pray for them (Romans 12). It goes on to say not only should we do this but we have to provide for them as well. So there we have it - we can expect persecution in often HUGE ways, and how do we respond to such persecution? We look to Jesus and use His example - by love and by teaching often through example of what following Jesus has done in our own lives. We have been told to go into all the world and preach the Gospel - teaching them in all manner of ways the truth about Jesus and what exactly following Him implies. Our aim through all of this is to bring other people to the truth about Jesus and how His love, grace and mercy can set us free. It's not all about us and certainly not about us being vindicated or to be shown that we were right and they were wrong! Lord as we enter another week, I pray that you will heal any broken hearts and deep wounds caused by all sorts of persecution. We realise that persecution of your people will certainly come to us. Help us by your amazing grace and the power of your Holy Spirit, to love others as you do and help us also to hold on to your example. 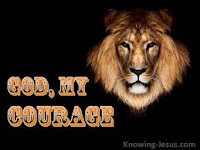 Help us to be courageous and brave through these turbulent times and to remain strong and steadfast for you.